Westmoreland Sanctuary is located at 260 Chestnut Ridge Rd in Bedford, NY. It is 625 acres and has a perimeter trail of just under 5.5 miles with many connecting trails. The start and finish of the trails are at the close to the highest point in the sanctuary so any run will start off downhill and end uphill. There are usually some trail maps so grab one if you are unfamiliar with the sanctuary. If you frequent the sanctuary, buy a t-shirt and/or join as a member. They have great school programs and I have been to a birthday party there that was very well done and the kids loved it. The Westmoreland Sanctuary is directly across I-684 from the Butler Sanctuary (described in an earlier post). For the ambitious, a combined loop between Butler and Westmoreland can reach 9 miles or more. 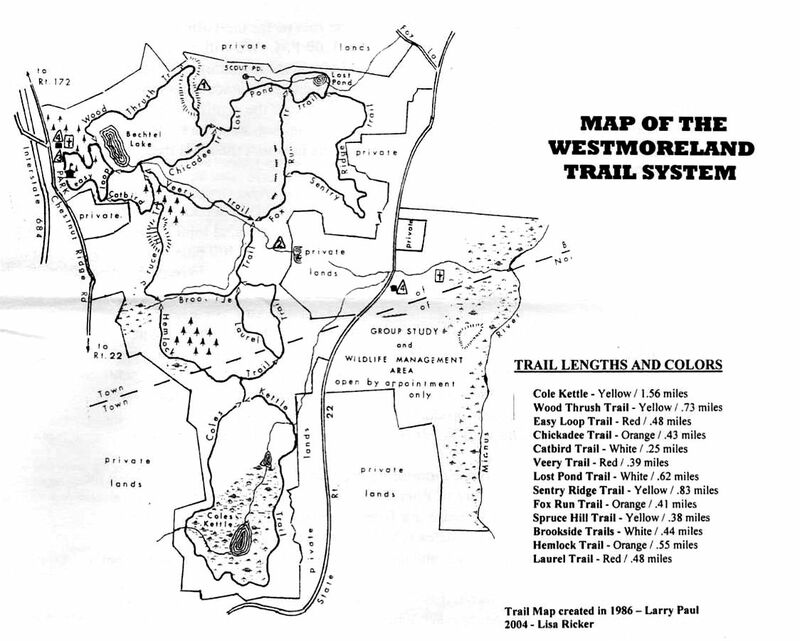 A trail map is available here (or here if their site is updated after this post). The counterclockwise (shown to the left, all right turns) perimeter trail starts to the south of the museum building on the “Easy Loop” which almost immediately turns into the Catbird Trail then the Hemlock Trail and then a right turn onto the Cole Kettle Loop. (Skipping this Cole Kettle loop cuts about a mile off of the run for shorter trips.) The Cole Kettle loop features a 200 ft boardwalk near an authentic glacial kettle formation. A worthwhile mile, reminiscent of the muddy Leatherman’s trails on the western half (depending on the recent weather). After the Cole Kettle loop, follow the Fox Run trail until you take a right onto the Sentry Ridge trail. This trail reaches its easternmost point on a high cliff overlooking Route 22. You can see the roofs of several houses below. Heading back west, continuing on the Sentry trail, you reach the Lost Pond trail which encircles Lost Pond and continues to the Wood Thrush trail. The Wood Thrush trail climbs up to the highest point in the park then dives back down before a last 150 ft climb over the last quarter mile. Taking the Chickadee trail instead of the Wood Thrush trail will save some up-down-up climbing and shorten the run by about a quarter of a mile.